Good hummus is hard to find; I find that most lack the acid needed to balance the nutty richness of tahini and olive oil, making it fall flat on your tongue. 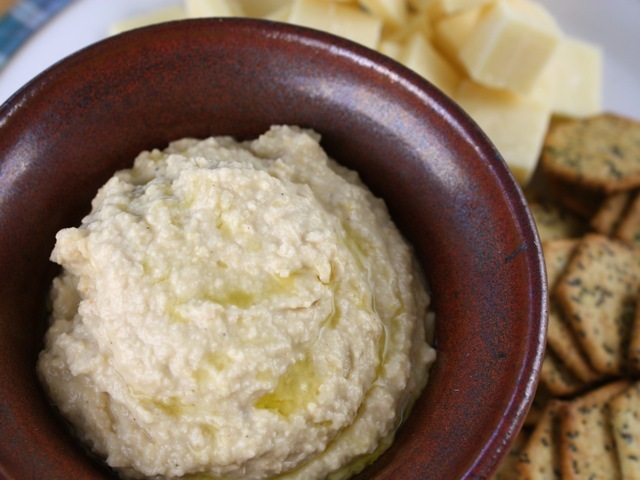 A little extra lemon juice completely transforms hummus into something much brighter in flavor. That's why the best hummus is homemade — besides, nothing could be simpler or more satisfying. I firmly believe that my mother's hummus is the benchmark for all other hummus out there. She personally taught our chef Eddy how to make it, and he in turn has trained all of our crew to make exceptionally delicious hummus. I keep a blend of ground toasted cumin and coriander in my spice set; it's a great addition to Middle Eastern and Mexican dishes. I usually toast 2 tablespoons each of the whole spices in a sauté pan on low heat until aromatic and lightly toasted, about 2 minutes. Once cooled, I grind in a coffee grinder reserved for spices; a mortar and pestle also works. Put the garlic in the bowl of a food processor and pulse a few times to chop. Add the remaining ingredients, along with ¾ teaspoon salt. Blend until smooth, scraping down the bowl as you go. Taste and add more lemon juice or salt as needed; to get the right balance of flavors, it should taste bright with lemon juice, rather than heavy with beans and tahini. You can also adjust the consistency with a little more water, if you like (keep in mind that it will stiffen considerably when chilled).